"I just got my SOK, and... OMG!!! 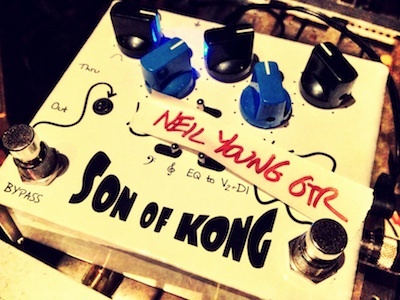 From the first time I heard about this pedal, The Son of Kong had me fidgeting like a Curious George. And now I have one. Needless to say, I am NOT disappointed. This deceivingly heavy little box just turned my pedalboard into a rack system! Everything I run through the SOK can be dialed in to sound way more defined and colors my sound like no other pedal of its kind... (wait.. there is no other pedal of its kind). And the output this little monkey delivers is by far the most powerful I've ever encountered! TONE MONSTER! And, although I could probably get away with just using the SOK alone, I think I'll need 3 more of 'em just so that I can have presets for each of the pedals I've had the pleasure of stacking it with. On another note, I've always been a big fan of Parametric EQ's and the SOK's blows all others out of the water! I sure hope the pots in this thing will withstand my endless tweaking. Having fun! Can't say enough. Thank you, "Midget" and crew at Spontaneous Audio Devices! My once seemingly endless pursuit for the holy grail of tone machines has ended. Thank you... Thank You... THANK YOU! Cheers!" "While mixing Willie Nelson's 80th birthday concert, I used the SOK on all of Neil's (direct) acoustic guitar tracks to add a fantastic body and presence to the sound. It's amazing how many ways there are to use this thing!!" Seven-time Grammy Award-winning mixer, engineer, and producer. Amazing Nashville session guitarist Tom Bukovac shows off some of the many sounds and tonal variations possible with the Son of Kong EQ/Gain Pedal and DI. Part II begins with clean sounds and ends with a full on assault. Throughout the video,Tom doesn't change any settings on his guitar or on his amp, and uses only the SoK between his guitar and amp, With amp-crushing Gain Boosts, a super-flexible EQ, and an ultra-musical DI, the Son of Kong is the final word in tone control.